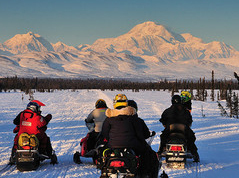 Explore Anchorage - your Gateway to Alaska‘s Great Outdoors! Explore Alaska's largest city and visit the many points of interests. Take a walk on the Coastal Trail along Cook Inlet to Earthquake Park with a magnificent view of the snow capped Alaska Mountain Range in the distance, visit Alyeska – Alaska's largest Ski Resort or have a delicious dinner at one of Anchorage's top seafood restaurants. During February and March Anchorage hosts the annual Fur Rendezvous, Ice Carving Festivals, the Iditarod Sled Dog Race and other super natural winter events. Please note: The sightseeing tours can only be booked in combination with our tour packages. 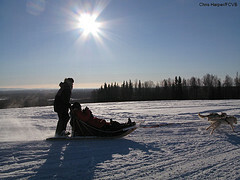 Dog Sledding is Alaska's official sport - have you ever seen a state with a more original sport? Meet the team at Dallas Seavey Racing for a full day dog sledding tour. This tour includes gear demonstration, Q&A with a genuine dog mushing, a meet & greet with the dogs that will be running this year's Iditarod & a chance to ride the runner of a dog sled behind some of the best canine athletes in Alaska! You will learn about what it takes to train a team & compete in the "Last Great Race" from a professional racing kennel! Our tour guide will pick you up on one of our comfortable touring vehicles then travel the snowy roads north into Willow, along the way telling you all about the area. Your guide will stop for photos of Mt. McKinley if the skies are clear we have a beautiful view!. There is nothing like the thrill of driving your own snowmobile! Riders over 16 each get their own machine to cruise through the wilderness on this 8-hour tour. On these machines, we can really see "back country" like we cannot from the highway. Many Alaskans own their own machines and spend the winter weekends outdoors basking in the midday sun and cruising the wilderness on snowmobiles, pumping up the adrenaline - it's what keeps us going! You won't regret really getting out there to see what the Chugach Mountains have to offer you. Wind through open fields, see beaver ponds, and frozen waterfalls. 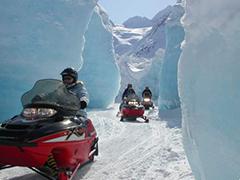 Under the right conditions your professional snowmobile guide will take you out to the glacier to see the icebergs and caves! Considered by many as a “Blue Ice Paradise!” Tour includes transportation, winter gear, glacier water, snacks. The Matanuska Glacier is a stable 27 mile long river of ancient ice. Thousands of years old, this massive glacier is tucked up into the Matanuska Valley. You spend 2 h. on the glacier learning how the glacier has formed the landscape in the Matanuska Valley. Explore blue meltwater pools, the ice formations and deep crevasses that make up the Matanuska Glacier. Walking on ice is slippery fun so our guests are equipped with a helmet, walking stick and cramp ons for your shoes. This tour requires a walk of 1.5-2 h. In these winter months, we will actually have the assistance of a snowmachine. Of course, our fully-guided transportation includes a pick up at your hotel in Anchorage as well as water and snacks in the touring vehicle. We will also stop for lunch where we will overlook the glacier while enjoying some yummy Alaskan fare..